With incredible infrastructure, charming coastline cities, and an array of paradise South Pacific islands just a short voyage away, we’re never surprised when the CLIA reports about the growing popularity of the Australian cruise industry. However, we were recently taken aback when a recent report revealed that the number of Australians cruising to Alaska had grown by 25% in 2016, alone. Positioned at the other end of the planet with weeks of sailing separating them from Australian shores, the Alaskan cities don’t seem the obvious first choice for cruise fans looking for new experiences. However, when we take into account the incredible landscapes, wonderful wildlife and amazing indigenous cultures – it all starts to make sense. So, if you’re one of the growing number of Australians looking to cruise to Alaska- we’ve put together everything you need to know before booking your holiday to USA’s northernmost state. Thanks to its northerly position, Alaska receives extreme variations in its daily hours of sunlight. In the middle of winter, Alaskan cities will receive as little as five hours of sunlight per day, whereas the summer months will be treated to almost 20 hours of sun. This should be a consideration for when you’re looking to visit, to ensure maximum opportunity to enjoy the scenery and spot breaching whales. June 21 is often the longest day of the year in the Northern Hemisphere, so we’d suggest sailing as close to this date as your budget allows – naturally, prices can increase the more in-season you travel. The cities of Alaska don’t always have the same cruise infrastructure and supersize terminals we take for granted in Australia. This means that many of the bigger cruise ships have to skip port calls and simply sail past some highlights of the state. We’d suggest picking a cruise line with smaller ships to guarantee maximum port calls. The likes of Silversea and Seabourn offer Alaskan cruises and their smaller scale ships can get you to the heart of the culture, and offer a more intimate experience. Assuming you’ve travelled from Australian shores, you’ve come a long, long way, and should absolutely make the most of your time in the Northern Hemisphere. We’d recommend tagging an itinerary around Canada or one of the USA’s coastlines onto the start or end of your cruise – experiencing the best this amazing continent has to offer. Even if you are travelling in the height of the Alaskan summer, you’re still likely to experience cold temperatures and difficult climates. Much of the allure of cruising around Alaska is enjoying the scenery on offer from the deck of the ship. And, if you want to make the most of these awe-inspiring scenes, we’d really suggest spending as much time on the top deck of the ship as possible. The cold sea wind will mean you’ve got to really wrap up warm to make the most of the beautiful views on offer. Long days of sun, reflective stretches of sea and snow-capped tundra – the threat of sun damage is very real when cruising around Alaska. This makes it hugely important to ensure you pack enough protection against the sun, so be sure to include enough sunscreen to cover the whole family as well as tight-weave clothing, wide-brimmed hats and sunglasses. Whether you’re on the top deck watching whales glide by, or hiking through one of Alaska’s snow-capped trails, you’ll be thankful you followed this piece of advice. 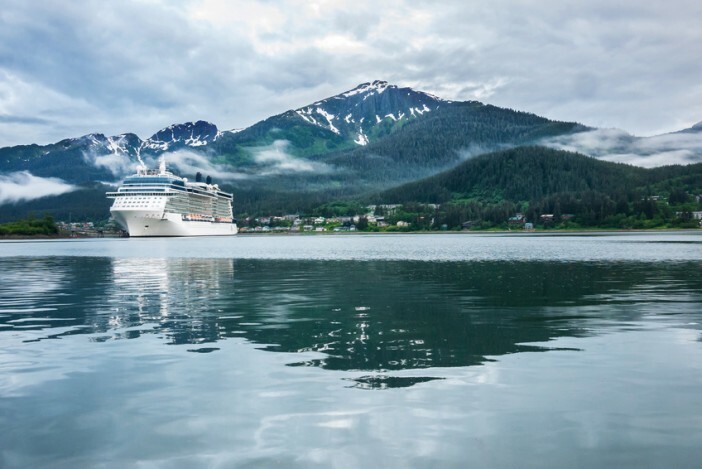 The cruise terminals of Alaska are quite remote, far from one another and far from some of the most amazing sights this incredible state has to offer. That is why we’d suggest going big during the shore excursions – booking your place aboard seaplanes and helicopters where possible. This gives you the opportunity to really explore the very best of this beautiful part of the world. We’ve so many amazing cruise deals, heading over to Alaska, we have produced a special section for this amazing part of the world. Click here to see our latest cruise deals to Alaska, or give us a call on 1300 857 345. Our team is made up of hugely experienced cruise experts, and will help you pick the perfect Alaskan cruise tip for you – ensuring you enjoy the trip of a lifetime.